Hadn't been cooking or baking for a while and started reading my recipe books in order to look for some inspiration. I have this book titled "The New Best Recipe" from the editors of Cook's Illustrated and I personally love how detailed their recipes are. Their recipe format starts off with first telling how great something actually is, but how it has lost its originality and 'taste' due to various factors and then the entire method on how they keep experimenting with different tips and techniques to come up with the "best" recipe. I am not sure about whether they are 'best' but the recipes are pretty fool proof and turn out pretty good. 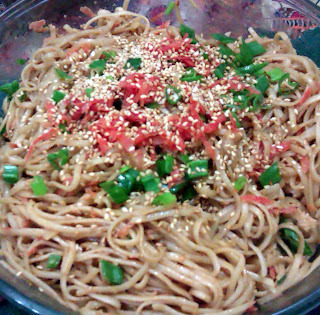 So while going through the book, this recipe literally said 'pick me' and the idea of a cold noodle salad in the hot & humid Karachi weather sounded like a pretty good idea - also, it wasn't technically a salad and it was easily enough for 3 people at dinner with plenty of leftovers for lunch the next day. Also, please make sure you serve the dish cold. For some reason, I felt my brothers might not like the idea of something cold for dinner, so I served it warm and well, the flavors just didn't meld properly - kept it in the fridge for a bit and it tasted fantastic. 1. Toast the sesame seeds in a medium skillet over medium heat, stirring frequently, until golden and fragrant, about 10 minutes. Reserve 1 tablespoon sesame seeds in a small bowl. In a blender or food processor, puree the remaining 3 tablespoons sesame seeds, peanut butter, garlic, ginger, soy sauce, vinegar, hot sauce, and sugar until smooth, about 30 seconds. With the machine running, add hot water 1 tablespoon at a time until the sauce has the consistency of heavy cream, about 5 tablespoons; set the mixture aside (it can be left in the blender jar or food processor workbowl). 2. Bring 6 quarts water to a boil in a stockpot over high heat. Meanwhile, adjust an oven rack to 6 inches from the broiler element; heat the broiler. Spray the broiler pan top with vegetable cooking spray; place the chicken breasts on top and broil the chicken until lightly browned, 4 to 8 minutes. Using tongs, flip the chicken over and continue to broil until the thickest part is no longer pink when cut into and registers about 160 degrees on an instant-read thermometer, 6 to 8 minutes. Transfer to a cutting board and let rest 5 minutes. Using 2 forks, shred the chicken into bite-size pieces and set aside. I didn't go through the long procedure of broiling the chicken. Just put some salt & pepper on the chicken and left it to rest for a few minutes. Then heated a bit of oil in a frying pan, sauted 1 tsp of garlic paste, added the chicken and let it cook for a bit till the water dried and the chicken was cooked through and tender. Add the salt and noodles to the boiling water; boil the noodles until tender, about 4 minutes for fresh and 10 minutes for dried. Drain, then rinse with cold running tap water until cool to the touch; drain again. 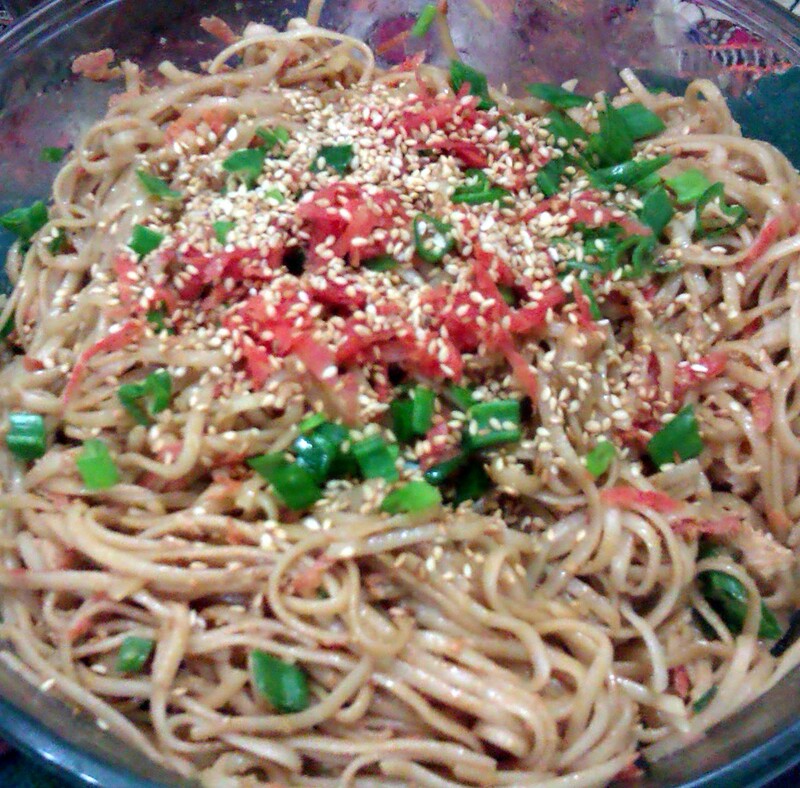 In a large bowl, toss the noodles with the sesame oil until evenly coated. Add the shredded chicken, scallions, carrot, and sauce; toss to combine. Would suggest adding only half the sauce in the beginning, then tasting and adding more as required. Adding all of it together makes adjusting the taste later on very difficult. Divide among individual bowls, sprinkle each bowl with a portion of reserved sesame seeds, and serve.